I love creamed spinach. It is the perfect creamy savory heavenly comfort food veg. It is both old fashioned and timeless. In South Africa if you order a meal which comes with hot veg of the day, you are more than likely going to get creamed spinach and butternut mash. It's something we have grown up with and love (or hate). That said until a few months ago I had never made it at home. I read up about it online and was surprised to find that one needs to cook it for a good 30 - 45 minutes. I had thought that a leafy veg would become soft in minutes. After testing this out for myself (as I am not a fan of veggies cooked to death) I found that it really is necessary to cook it for that long. That is, if you want it to be melt in your mouth soft and creamy. Before I give you the recipe I feel it is necessary to bring up something I am always surprised so few people know: the difference between spinach and Swiss chard. The spinach I grew up with in South Africa is a big dark green curly leaf with a thick white stem running up the center. Well it's not, it's actually called Swiss chard. The leaves which later hit our shelves called baby leaf spinach or English spinach are actually real spinach. Real spinach is a small bright green oval leaf and has no white stem growing through the leaf. If you are confused - go to google images and search for Swiss chard and then search for spinach. You will quickly see the difference. The relevance of this differentiation is twofold for my recipe for creamed spinach. In preparing Swiss chard for cooking, you need to wash it even more thoroughly as the curly leaves trap more dirt than flat spinach leaves. You also then need to trim the white stems out of the leaves and chop these finely, so that they are not stringy and tough. In cooking Swiss chard, because of its tougher leaf, it needs to be cooked longer than spinach before it becomes tender and creamy. So be aware of this before tackling any recipe including spinach when you are in fact using Swiss chard. Wash your spinach really really well and drain it. In a large pot dry fry the still wet spinach till it is soft and reduced. Drain and rinse it in a colander with cold water. Then squeeze the spinach between your hands, squeezing as much moisture out as you can. Chop it roughly. In a medium sized pot fry the onions in the oil until soft. Add the spinach and simmer for a minute or two. Add the coconut cream and turn the heat down to a low simmer. 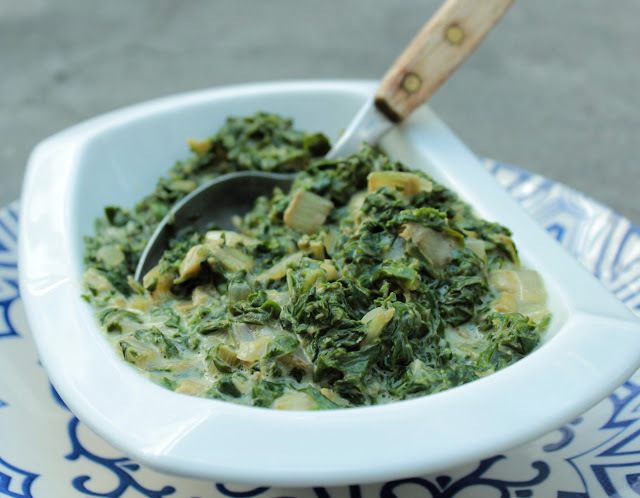 Leave the lid off the pot and let the spinach simmer for about 30 minutes stirring from time to time until the spinach is soft and creamy and the cream has thickened. Season with salt, pepper and nutmeg. A tiny dash of soya sauce can also add a bit of depth but is totally optional. This is a great side veg for meat and also lovely for breakfast on toast topped with a poached egg. One of my favourite veggie meals is mashed potato with creamed spinach topped with pouched eggs. Super yum. Congrats for the blog award on Indie Chicks...I voted for you :) Love youuuuuuuuuuu. Thanks darlin!!! What a lovely affirmation to start a Monday with!